Rod Chase is one of the most well-known photo-realist painters today. This outstanding work pays tribute to one of our nation's Founding Fathers, Thomas Jefferson. 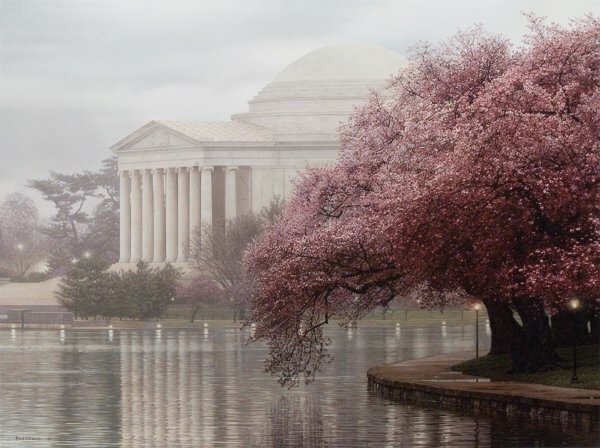 This magnificent image showcases the Jefferson Memorial during the peak of the world-famous cherry blossoms. Several lush trees captivate the scene with their splendid branches of ripe blossoms cascading over the Tidal Basin, almost touching the tranquil water. The Jefferson Memorial takes on a ethereal quality as the mass of gray clouds surround the building, almost blending with the stately architecture of the memorial to the great man. Enchancing this elegant, quiet scene, the pathway lights and the building's columns reflect in the water to complete this amazing image.